What diet has America chosen? It's obvious from looking around any grocery store (or watching any TV broadcast) in America that the nation has chosen to pursue a disastrously bad diet. The vast majority of "food" products sold at grocery stores are manufactured, processed foods made with chemical additives, cooked at high heats that produce dangerous byproducts, and then packaged in toxic packaging materials like plastics containing BPA. America is addicted to fast foods and junk foods. People eat to fill their bellies and entertain their tongues, not to nourish their minds and bodies. Food has devolved from something that nourishes the body to a chemically-altered sensory addiction fabricated in a factory somewhere. So instead of food being medicine, it has become a source of disease. And America is paying a dear price for choosing this route. All the negative repercussions of choosing a bad diet are now coming true in America: Increased crime and chronic degenerative disease, reduced cognitive function and productivity, huge increases in health care costs, rising infertility, increases in birth defects and mysterious neurological disorders, and so on. These negative consequences of a bad diet are causing the rapid erosion of America's economy. Faced with the burden of carrying tens of millions of sick people who could otherwise be productive if they had chosen the path of nutrition, the U.S. economy is dragged down by the weight of sickness and disease. Its competitiveness is drastically reduced by the suppressed cognitive function caused by processed foods and chemical additives. Its education system has fallen far behind world standards, thanks in large part to the brain-slowing junk foods children are fed at home and at school. The result? A nation that can't compete. And that sets off a chain reaction of offshoring, downsizing, and job sector reconfigurations that see millions of U.S. jobs shifted overseas where workers offer higher productivity at lower costs... and where health care is a fraction of the price of the United States. Taiwan, for example, offers a nationwide, universal health care solution for just $21 per month (http://www.naturalnews.com/027133_h...). In the U.S., the annual health insurance premium for a family of four is anywhere from $10,000 - $15,000, and that doesn't even include out-of-pocket expenses for doctors' visits, medications and deductibles. 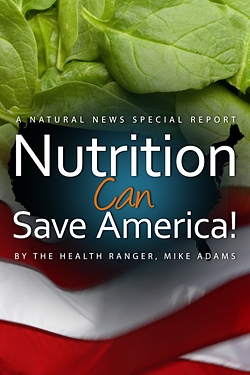 Poor nutrition has put America into a debtor's prison when it comes to health and medicine. All the diseases caused by the consumption of unhealthful foods have made American workers virtually unaffordable for global businesses due to outrageous health insurance costs. All of this could have been prevented with a better diet for America. So let's get to it!